Home / News / Learn These Stunning Finishes At Our NEW Artisan Enhancements Workshops! Learn These Stunning Finishes At Our NEW Artisan Enhancements Workshops! At Bella B Décor we can't be more excited about bringing you the most creative, up-to-date paint and products on the market today. And beyond offering the best there is, we delight in staying on top of the color and design trends for our workshops! 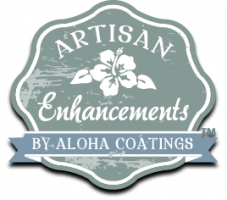 Artisan Enhancements is a popular line of green products that we sell - and love. Coming in December, we will be teaching exciting new finishes for furniture, canvas art, outdoor statues, picture frames and more. Discover foils, stencils, textures, plaster and soft sheens galore! Sign up TODAY on our website. These workshops will fill up quickly.